Traditional fireplaces are often found in homes and rarely in apartments, condos, town homes, or small family homes. Electric fireplaces are the perfect solution as they come in a large range of sizes, styles, and configurations that will allow anyone to maximize the amount of space in their home so that every square foot is effectively utilized. Electric fireplaces are low maintenance, energy efficient, and most importantly safe for your home. There are four types of electric fireplaces that can work for your home. Wall fireplaces are easy to install and can mount onto any standard wall. We do recommend that wall fireplaces are mounted onto the wall via the wooden or metal stud that generally is built behind every wall. Corner fireplaces fit into any corner space to maximize space and beautify the otherwise dull corner of your home. Entertainment center fireplaces double as an entertainment center for your LCD television, while providing storage and display space for your picture frames or electronic entertainment pieces. Amish fireplaces feature convenient wheel casters for mobility, are small in size, and can be easily transported from room to room in your apartment or small single family home. Allocate Every Square Foot of Your Home! Electric wall fireplaces do not take up any floor space and mounts easily to any wall. All Portable Fireplace wall fireplaces feature a standard three prong electrical plug that will plug right into any standard household electrical outlet making it convenient to install and operate. 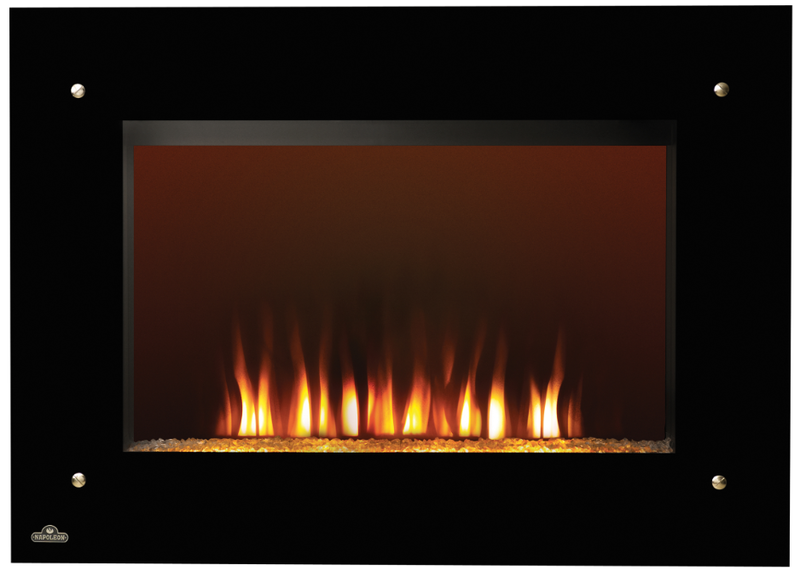 Enjoy the presence and ambiance of a real fire with an electric wall fireplace. Wall mounted fireplaces are available in a variety of styles that can match with contemporary, transitional, or traditional style themes for your apartment or small home. Corner electric fireplaces are the perfect solution for anyone looking to furnish or decorate the corner of any room. Corner electric fireplace are available in a wide variety of styles that can accommodate the theme of any home. Similarly as with electric wall fireplaces, corner electric fireplaces feature a standard three prong electrical plug that will plug into any standard household electrical outlet. Entertainment center fireplaces can replace your dull entertainment center and support your LCD television while providing warmth and comfort to family and friends. Most Portable Fireplace entertainment center fireplaces will feature cabinets on either side and glass doors with shelves to display your favorite pictures and fancy electronic devices. All electric fireplaces are fast, easy, and convenient to operate. Drive down your energy bills by providing specific heat to occupied rooms, household heaters will provide heat to the entire house making it much more expensive to turn up the heat of your apartment's heater to reach all of the rooms versus having a convenient electric fireplace providing heat to the specific room. This green method of heating is also known as zone heating. Portable Fireplace Amish Heaters work best for zone heating as they feature wheel casters which enable the electric fireplace to be conveniently moved from room to room. Electric fireplaces consume approximately as much electricity as your household coffee maker which converts to only 11 cents an hour! Electric fireplaces offer the warmth and ambiance of a real traditional fireplace without the cleaning, maintenance, or expensive fuel required. In fact many people enjoy the patented state of the art modern flame technology so much that they will have their electric fireplace flames on with the heat turned off so that they may enjoy the ambiance after a long day of work on warmer nights. These modern flame effects can be enjoyed from every angle, which is one of the reasons why it is so realistic! If you are an owner of a rental property and would like to invest in your property to increase the aesthetic appeal and functionality of your property without overspending, electric fireplaces may be the perfect solution. Owners will normally choose their investments wisely, and only invest in items that may increase or secure a return. Electric fireplaces do not cost anything to install as opposed to traditional fireplaces which are extremely expensive to install and may even be damaging to your home over time. Properties in the warmer climates can enjoy the ambiance of a traditional fireplace without the heat, simply plug in your electric fireplace and turn on the realistic flames while keeping the heat setting off. Modifying the structure of a rental property is normally not an option, you can with an electric fireplace as it does not affect the surroundings and does not require any type of structural accommodation. Electric fireplaces do not require venting, a chimney, or a hearth. Cast aside all worries about damaging your rental property from accidental fires, burning embers, and ash as all electric fireplaces provide heat via electricity. With all of the benefits, perks, and money saving features of owning an electric fireplace it is no wonder that it is increasingly popular for American homes every year. Let Portable Fireplaces sales associates help you select the perfect electric fireplace for your apartment, condo, cottage, or small space today!